L: As the owner of Nelle, I am always focused on growth and development, I think having that ability to forecast and anticipate shifts in the market are what has helped Nelle to grow into the company it is today. I am currently in the process of restructuring & re-branding Nelle so much of my time right now is spent working on that project. BB: When designing your fabulous handbags what are your inspirations? L: The fabrics have always been an inspiration for me. I fell hard for manipulating textiles years ago, which is why you will never see a plain fabric clutch from me. Why? It's too easy to find a fabulous print to make a clutch out of! BB: Was there a specific event or person in your life that led you to begin designing? L: I spent my college years working at various flower shops and fell pretty hard for that industry, but the realities were that to open a floral business requires a great deal of overhead. So I thought on it and concluded that handbag design was the next best thing, both mediums work with color & texture in a 3d space. BB: If you could give any famous woman, current or historical, a makeover, who would she be and how would you style her? L: As a rule, I don't believe in makeovers, our culture is a little too obsessed with the idea of reinvention and I personally miss seeing people's authentic style walking around - even if that sometimes means tweety bird t-shirts. With that said, if there was one wedding trend I would love to see disappear, it would be red roses, I’m not a fan of them. L: I rocked a sweet grunge look all through high school, and had the most fabulous pair of camouflage pants that I use to wear with an oversized brown wool J Crew sweater, I even had an amazing perm. I loved it all and wouldn't change it. L: I might have worked in advertising or I might have been a historian or scientist, it could still go either way. BB: What's your favorite handbag in your collection? L: Like most designer's I always like what I have just made so the Delphine minaudiêre is my new favorite. Other clutches that keep me smiling are the Just Bowtiful clutch & the Perfectly Petersham clutch. Surprisingly, I am not a fan of the Classic clutch but I always seem to use that one when I head out! So silly. BB: Do you have any accessory rules to live by? L: I guess the accessory rule or fashion rule that I have is there are no rules. Rules squash style and that's how you end up with red roses. BB: What's in your handbag? 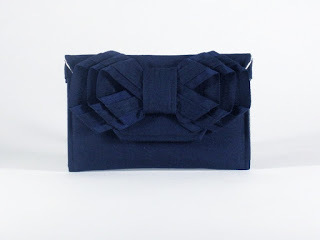 L: I don't carry a handbag, but I do use a custom navy Just Bowtiful wallet. Inside I have USPS tracking labels, receipts, credit cards & my cell phone.